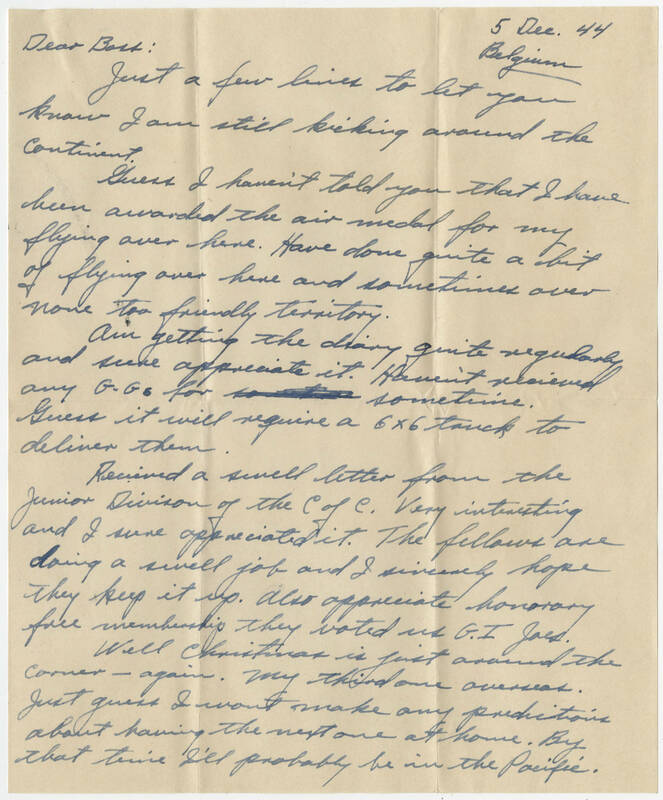 5 Dec 44 Belgium Dear Boss: Just a few lines to let you know I am still kicking around the Continent. Guess I haven't told you that I have been awarded the air medal for my flying over here. Have done quite a bit of flying over here and sometimes over none too friendly territory. Am getting the diary quite regularly and sure appreciate it. Haven't received any G.G.s for sometime. Guess it will require a 5x6 truck to deliver them. Received a swell letter from the Junior Division of the C of C. Very interesting and I sure appreciated it. The fellows are doing a swell job and I sincerely hope they keep it up. Also appreciate honorary full membership they voted us G. I. Joes. Well Christmas is just around the corner - again. My third one overseas. Just guess I wont make any predictions about having the next one at home. By that time I'll probably be in the Pacific.